"Reports have come in over the weekend that at least five Palestinian refugees in the besieged refugee camp of Yarmouk in Damascus have died because of malnutrition, bringing the total number of reported cases to 15," UN Relief and Works Agency spokesman Chris Gunness told AFP. "Since September 2013 we have been unable to enter the area to deliver desperately needed relief supplies," Gunness said. "The continued presence of armed groups that entered the area at the end of 2012 and its closure by government forces have thwarted all our humanitarian efforts." The blockade has resulted in a humanitarian crisis, and the exodus of tens of thousands of the camp's 170,000 residents. UNRWA chief Filippo Grandi addressed the situation earlier this month, warning that conditions in Yarmouk had "progressively deteriorated". "If this situation is not addressed urgently, it may be too late to save the lives of thousands of people including children," he warned. Gunness said UNRWA was calling "all parties to immediately heed their legal obligations and facilitate the urgent provision of humanitarian assistance to Yarmuk and other Palestinian refugee camps." It added that the elderly Ibrahim Bibi 60 and Mohammed abu Naser both died of previous injuries they sustained in Syrian army bombing on the camp. According to the group, Rabeaa Madi, Bashar Ajan and Mayssra Qonberji died as a result of malnutrition and the lack of the necessary treatment. The Group noted that Khan al-Shiekh refugee camp is a subject to almost daily shelling and is reeling under a life-sapping blockade by the Syria Army. The people of the camp appealed all the international bodies of the United Nations, local organizations of the Palestinian movements and Palestine Liberation Organization , which considers itself the legitimate representative of the Palestinian people, to intervene to lift the injustice the Palestinian refugee camps in Syria suffer, the group said. Youth initiative for Supporting Refugees in Gaza organized on Sunday evening a solidarity sit-in to support the Palestinian refugees in Yarmouk camp. Several Palestinian families who returned from Syria in addition to human right activists participated in the sit-in. “ We, the people of the Gaza Strip, support our families and brothers in Syria and we will not hesitate to help them with all possible means,” The chairman of the initiative Mostafa Mater said. He affirmed that the Palestinians in Syria don’t need denunciations, they need real actions to put an end for their suffering. The working group for the Palestinians in Syria reported that two Palestinian refugees died on Saturday due to the continued shelling and siege on Syria refugee camps. 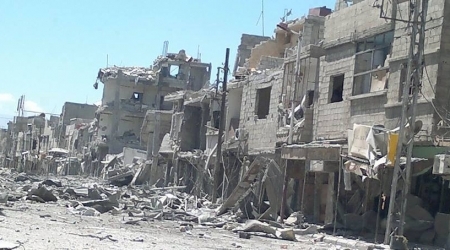 The group said in a press statement on Sunday that a young man from Daraa camp was killed by shrapnel of mortar shells that fell on the camp, while a woman in Yarmouk camp died of starvation because of the blockade imposed on the camp. It added that Tarchiha neighborhood in Handarat camp in Aleppo was bombed, which resulted in significant damages in the place, pointing out that most of the camp residents have fled due to the continued clashes and shelling. Violent clashes also took place in Daraa camp between groups of the free army and the regular army and a number of shells fell on different places, causing no casualties, the activists reported. They noted that the Yarmouk camp is suffering a humanitarian disaster after running out of food and medicine because of the continued siege imposed by the Syrian army forces and groups of the Popular Front - General Command - on the camp for 165 days unabated. The working group pointed that in December 2013 eleven refugees died in the camp due to malnutrition, while power outages has continued for more than a year. Six Palestinians died Friday of hunger in Syria's Yarmouk refugee camp due to the siege imposed on the camp , and the continued bombing on it. Action Group for Palestinians in Syria said in a statement that "five Palestinian refugees have died as a result of the siege of Yarmouk camp imposed for 164 days in a row and the lack of food and medicine,"
The group identified them as Ahmed Rashid Hamid, Fayez Saadia , Zuhair Sinan, Houidh al-Hamawi , and Ahmad Odwan who is physically challenged. While child girl Janah Shadi from A'edeen refugee camp in Homs died of injuries sustained in a blast that hit camp on Thursday, the group added. 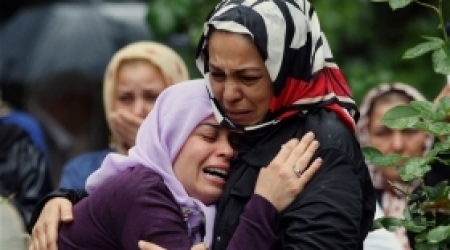 A state of panic , tension and fear caught the people of the camp after Thursday's blast which occurred in front of a food shop in the middle of Al-Quds Street, which killed two including the girl and wounded many including women and children, the statement said. The Group noted that Khan al-Shiekh refugee camp is subject to almost daily shelling resulted in many its residents killed and a large number wounded, and is reeling under a life-sapping blockade by the Syria Army. The people of the camp appealed all international bodies of the United Nations and UNRWA, or local of the Palestinian movements and the Palestine Liberation Organization , which considers itself the legitimate representative of the Palestinian people, to intervene to lift the injustice the Palestinian refugee camps in Syria suffers, the group said. In Dera'a refugee camp, the Palestinians suffer from scarcity of food, medicines, fuel and the continued power and communication cuts for long periods of time. A co-founder of the Crescent and Cross Solidarity Movement says the war on Syria is aimed at destabilizing the whole Middle East in favor of the Israeli regime. In an interview with Press TV on Wednesday, Mark Glenn pointed out that large numbers of people displaced by the foreign-backed militancy in Syria are headed for neighboring countries, which cannot cope with the massive inflow of refugees. Dealing with Syrian refugees “was exactly what was factored into the entire equation when the United States, her Western allies and Israel went about this process of destroying Syria,” Glenn stated. “This is not just a war against Syria, it is a war against all the neighboring countries of Syria,” he stressed. The remarks followed a report by the United Nations refugee agency (UNHCR) saying Syrian refugees make up some 20 percent of the population in Lebanon. According to Glenn, the situation in Lebanon and other neighbors of Syria is analogous to the aftermath of the US-led war in Iraq, which sent millions flooding into Jordan and to other nearby countries. “So this is not just a war that has been waged against Syria, it has been waged against all of these countries… and so this just fits in with both Israel and United States’ plan of destabilizing all of the countries in the Middle East so as to make Israel the lone superpower in the region,” he added. While target countries have to accommodate, feed and shelter refugees, the West will use this as a lever to demand certain concessions from their governments in favor of Israel, the Idaho-based analyst explained. According to the UNHCR, the number of Syrian refugees is over 2.3 million. Lebanon, which refused to set up official camps for the Syrians, currently hosts the highest number of the refugees, while over a million others have fled to Jordan and Turkey. The UN refugee agency also said some 4.2 million people have also been displaced inside Syria since the beginning of the conflict in the Arab country in 2011. According to reports, the Western powers and their regional allies -- especially Qatar, Saudi Arabia, and Turkey -- are supporting the militants operating inside Syria. 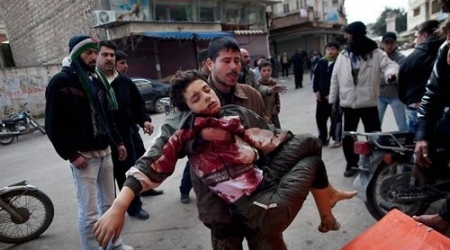 Syrian aircrafts continued their incessant bombing at Palestinian refugees camps; 7 Palestinians were killed on Tuesday evening, media sources reported. Action Group for Palestinians of Syria announced on a statement that Alaa Abu Rezzig a Palestinian refugee killed in a bombing at Dera' camp while a sniper belonging to Assad regime shot dead Jamal Hamad and his mother at Yarmouk camp in their way to Sbeina town. 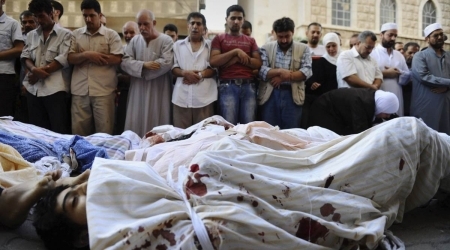 It also reported that Assad regime snipers shot dead two brothers , Wael and Ibrahim Musa at a besieged suburb in Damascus. Bahhar Nasiif from Latakia tortured to death in Assad regime prison and Qasim al-Mughrabei starve to death in the besieged Yarmouk camp. 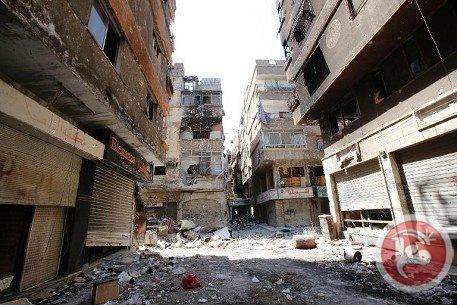 Syrian regime army imposed a siege on Yarmouk camp for Palestinian refugees since 161 days in a row. People in the camp suffer from food , medicine and fuel scarcity. Palestinian activists in Syria said that four Palestinian refugees were killed on Monday in Syria camps because of the continued attacks and siege. Action group for the Palestinians in Syria reported in a press statement on Tuesday that the two young men Shadi and Fadi Jebali, from the Yarmouk refugee camp, died under torture they were exposed to in the prisons of the Syrian security forces. Another young man Basil Berri was also killed during clashes in the Yarmouk camp, while Subhi Al Omari died of hunger due to the intensification of the blockade imposed on the camp for the 160th day, according to the statement. The working group added that the residents of the Yarmouk camp have staged a demonstration for the second day to demand lifting the siege imposed on the camp. For their part, Husseiniyeh camp residents have appealed to all Palestinian factions, the PLO and UNRWA to intervene to end the humiliation they are exposed to at the Syrian army checkpoint. 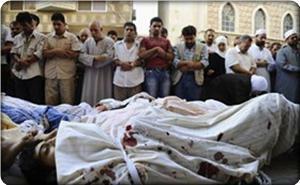 Hamas movement strongly condemned the “brutal massacre” in Dira refugee camp on Saturday that killed eight refugees. Hamas renewed in a statement on Sunday its call for neutralizing refugee camps in the current armed conflict in Syria and for providing safe shelters for families fleeing areas of confrontations. The movement called on the Arab League and human rights groups to intervene urgently to protect thousands of Palestinian refugee families in face of siege and murder inside Syria and to provide them with a dignified stay in countries to which they sought refuge away from death and destruction. For its part, the action group for Palestinians in Syria said in a press release on Sunday that 12 Palestinian refugees were killed in Syria over the past 24 hours including eight in Dira. 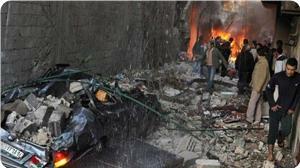 It said that Syrian warplanes shelled the refugee camp killing eight refugees including four women and a baby girl. The group said that four other young men were killed in Yarmouk refugee camp due to the continued clashes in and around the camp. People inspect damaged areas in Yarmouk camp near Damascus, July 24, 2013. The United Nations' Palestine refugee agency UNRWA warned that the lives of thousands of Palestinian refugees in Yarmouk camp in Damascus were at risk due to the ongoing siege of the camp by Syrian regime forces. Commissioner General of UNRWA Filippo Grandi said that "humanitarian conditions in the besieged refugee camp of Yarmouk are worsening dramatically and that we are currently unable to help those trapped inside." He stressed that if the situation was not addressed soon, "it may be too late to save the lives of thousands of people including children." "UNRWA remains constantly committed to assist, but the continued presence of armed groups that entered the area at the end of 2012 and its closure by government forces have thwarted all our humanitarian efforts," he added, referring to the fighting that has gripped the camp since it became embroiled in the armed conflict in Syria in December 2012. "20,000 remaining Palestinians have been trapped inside Yarmouk, and although very alarming reports of hardship and hunger have continued to multiply, since September 2013 we have been unable to enter the area to deliver desperately needed relief supplies." His comments come days after the PLO announced the failure of an agreement to lift the regime siege on the camp by asking all militant groups to withdraw and allow the area to remain a neutral safe zone. PLO authorities blamed the PFLP-GC, a Palestinian militant group closely aligned with the Syrian government, of foiling that agreement by deploying their troops in the camp. Grandi called on all parties to "immediately heed their legal obligations and facilitate the urgent provision of humanitarian assistance to Yarmouk and other Palestinian refugee camps where fighting impedes the delivery of such assistance," stressing that the "intolerable situation" must end. Yarmouk refugee camp was subjected to intense shelling on Friday, and the sounds of armed clashes were heard at the entrances to the camp. Mazen al-Asali, 18, was reported to have committed suicide after he was unable to secure food to feed his mother and sisters due to a blockade imposed on the camp since July. Five Palestinians were also killed across Syria on Friday in separate incidents linked to the armed conflict, including two who died under torture in Syrian regime prisons. Mohammad Ahmad Mashour from al-Nayrab refugee camp died on Friday early morning amid shelling on Hanano neighborhood of Aleppo. 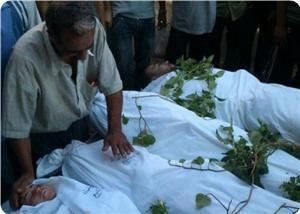 Nawaf Hantash and his wife, who name was not given, were killed during shelling on Homs, while his daughter wounded. Ahmad Abu Raya from al-Aideen refugee camp in the central Syrian city of Homs died under torture in a Syrian military prison. He was detained five months ago. Samer Walwel from Yarmouk refugee camp in Damascus also died of torture in a Syrian army prison. At least 1,500 Palestinians have been killed in the ongoing Syria conflict, and around 250,000 Palestinian refugees have been forced to leave their refugee camps in Syria due to violence in the country. Three Palestinian refugees killed on Tuesday evening by the ongoing Syrian regime air attacks against the Palestinian camps in Syria, the number of Palestinian refugees who killed in Syria is up to 1807. Action Group for Palestinians of Syria reported that Syrian regime forces shot Firas Maoued to dead at Zahira area near Yarmouk camp while Mohammed Swaireh killed in an air attack on Yarmouk camp. It also reported that the artist Hassan Hassan was tortured to death in a Syrian regime security prison. Hassan produced a group of short videos which reflect the suffering of Palestinian refugees in Syria. It reported that Syrian regime struck on Tuesday Yarmouk camp for long hours while other Palestinian refugees camps witnessed a cautious calm. Two Palestinian refugees were killed in the Yarmouk refugee camp in Damascus as a result of the ongoing clashes in Syria and an elderly woman died from exposure to cold, according to a Palestinian group. The Workforce for Palestinians in Syria said in a statement received by Ma'an Wednesday, that Yousif al-Khateeb and Muatasim Abdul-Ghani were killed Tuesday evening as a result of shelling in the Yarmouk camp. Several others were injured, and material damages were reported. 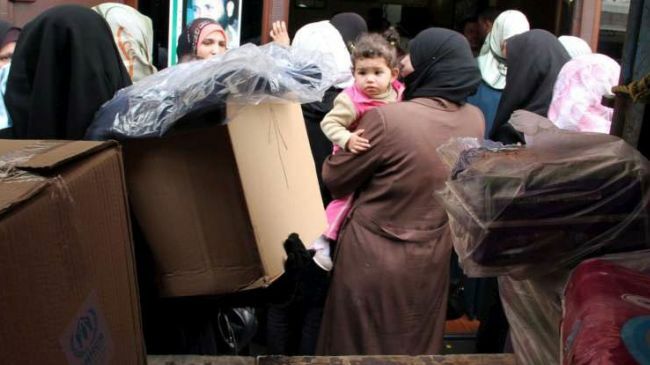 The report highlighted that several Palestinian families were forced to leave their homes in al-Huseiniyya refugee camp after the Syrian regime forces occupied the camp 67 days ago following fierce clashes with rebels of the Free Army. A majority of the residents fled to neighboring outskirts. Palestinian refugees in Yarmouk, Deraa, al-Huseiniyya, Khan al-Sheikh and al-Aedin refugee camps have been suffering during the winter storm which hit the Middle East this week, while those Palestinian refugees who have fled to other countries have suffered in poorly-equipped makeshift refugee camps. The main problems faced by refugees is the lack of fuel, gas and electricity for heating, in addition to the violence from the ongoing Syrian civil war. More than 1,500 Palestinians have been killed in the ongoing Syria conflict, and around 250,000 Palestinian refugees have been forced to leave their refugee camps in Syria due to violence in the country. A Palestinian refugee was killed on Sunday in Syria's Yarmouk refugee camp by the Syrian regular army, the Workforce for Palestinians group in Syria reported. 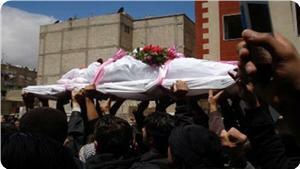 It said in a statement that Ibrahim al-Kafri died by a sniper bullet in the Yarmouk refugee camp. 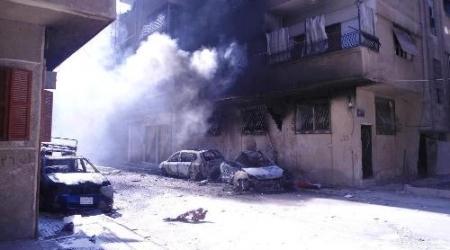 The group said that Yarmouk refugee camp in Damascus was under heavy shelling all night ; no injuries were reported. All main entrances to the camp have been closed for over 155 days and there has been no electricity since several days. the group warned of a serious humanitarian crisis as all hospitals and medical centers in Yarmouk have ceased to operate due to a lack of equipment, military attacks and robberies, the group added. According to the group, citizens of Khan El-Sheikh's refugee camp have been suffering from bad economic conditions due to the lack of food, medicine, and fuel and they called on UNRWA to hold its responsibilities towards them. The Action Group for Palestinians in Syria announced that six Palestinians were killed in Syria on Wednesday while a mother and her child drowned while trying to reach Greece in a boat. The group said in a statement on Thursday that six Palestinians were killed in an attack by armed men on a roadblock manned by the Palestinian Liberation Army in Reef Damascus on Wednesday. It said that in another incident Palestinian refugee Maha Al-Saadi and her child Abdulrahman drowned off the coasts of Greece after Greek coastguards forced a boat carrying refugees to return back to Turkish regional waters. The Israeli regime is panicking over Syrian President Bashar al-Assad’s success against foreign-backed militants, an analyst tells Press TV. “As peace starts to break out, the Israelis are panicking. 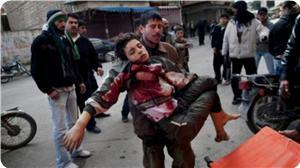 They’re panicking over… the success of the Assad government in Syria,” Kevin Barrett said in an interview on Wednesday. monitored elections, which I think Assad will likely run in and very possibly win,” the analyst stated. Barrett noted that Israel has been in cahoots with Saudi Arabia with a view to destabilizing Syria through setting off anti-government demonstrations in Damascus. “A lot of money was applied to this and once the demonstrations were set off and the Assad government reacted - overreacted - then the pre-planned destabilization campaign funded by billions of dollars coming from Saudi Arabia and directed in part from Israel targeted Syria and started ripping it apart,” he said. On Tuesday, the Syrian army reportedly captured a key town near the Lebanese border from militants. The Syrian army has been fighting against militants for several weeks to secure the Qalamoun region, north of Damascus. The army has recently conducted successful clean-up operations across the country, inflicting heavy losses on militants. Syria has been gripped by deadly unrest since March 2011. The Western powers and their regional allies -- especially Qatar, Saudi Arabia, and Turkey -- are reportedly supporting the militants operating inside Syria. The action group for the Palestinians in Syria said that four Palestinian refugees were killed by the Syrian regime during the past 24 hours. In a press release on Saturday, the group stated that three Palestinian refugees were killed on Friday afternoon by the Syrian regime forces and their militias at the main checkpoint of Al-Yarmouk refugee camp. It added that the victims were killed when Syrian soldiers at the checkpoint attacked peaceful protestors carrying some burial shrouds to demand the Syrian regime to end its blockade on the refugee camp and recall its troops. 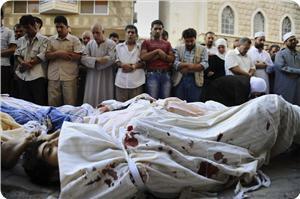 The group noted that other protestors were injured during the violent attack by the Syrian regime forces. Its statement also declared the death of another Palestinian refugee named Riyadh Qasem after his exposure to excruciating torture at the hands of interrogators in a Syrian jail. The group warned that the humanitarian situation in the Palestinian refugee camps has deteriorated very badly as a result of the tight blockade that caused an acute shortage of all vital needs. Earlier, two Palestinian refugees were killed in the refugee camps of Al-Yarmouk and Dara according to the action group. It said that Mahmoud Al-Refai was killed during a projectile attack on Al-Raija square in Al-Yarmouk camp and Ghassan Hammadi was shot dead by a sniper in Dara camp. It also said that the Syrian regime forces kidnapped a Palestinian charity activist named Khaled Humaid at the checkpoint of Al-Aydoun refugee camp in Homs, adding that another young man named Ali Rafea was reported missing near Al-Neirab refugee camp in Aleppo. 80 Palestinian refugees, 35 of them from Al-Yarmouk refugee camp, were killed last November as a result of the raging conflict in Syria, according to a report released on Thursday by the action group for the Palestinians in Syria. Palestinian activists in Syria announced that a Palestinian refugee was killed in one of the Syrian security agencies’ detention centers in Damascus. The action group for Palestinians in Syria said in a press release on Monday that Ayham Othman, a resident of Rukn Eddin suburb in Damascus, was killed under torture in Syrian prisons two months after his arrest. The group said that the martyrdom of Othman raised the number of Palestinian refugees killed in Syria since the events started there to 1718, adding that all those killed were documented by name. 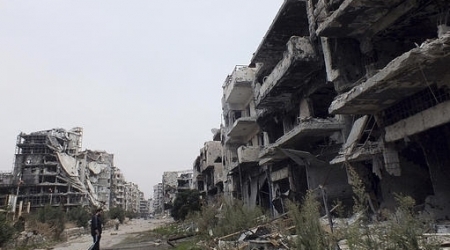 It said that the Syrian regular army was still imposing a tight siege on all refugee camps. The group also pointed out that Palestinian refugees, who sought refuge in Qadsiya suburb in Damascus, were not treated well by the opposition’s popular committees. It explained that a number of torture cases and kidnapping and asking for ransom were documented, adding that those committees pursued discrimination between Syrians and Palestinian refugees even in distribution of food and other rights. The action group said that around 6,000 Palestinian refugee families had left Yarmouk and other refugee camps due to the deterioration of security conditions and sought refuge in Qadsiya. A Palestinian young man died of dehydration and malnutrition in Yarmouk refugee, camp south of Damascus, on Wednesday night. The action group for Palestinians in Syria said in a statement on Thursday that Mahmoud Obaidi died as a result of the tight siege on the Yarmouk refugee for 127 days so far. It said that the Syrian regular army siege of the camp depleted most of its food stock and other basic and medical supplies, noting that hospitals and clinics in the camp were closed due to the continued shelling and looting. 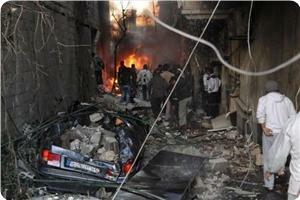 The group said that almost all other refugee camps in Syria are subjected to similar siege and shelling. The group also published appeals by Palestinian refugees fleeing Syria to Jordan calling for aiding them. The refugees said they were held in Cyber City compound and were isolated from the outside world and not allowed to leave the compound. The refugees said that they were treated like detainees and are only allowed out if Jordanians guaranteed their return. They said that some families fled the compound in view of the difficult living conditions inside it and were now wanted for the Jordanian security. Six Palestinian refugees were killed in Syria over the past 24 hours in shelling on their camps, activists in those camps said on Monday. The action group for Palestinians of Syria said in a press release that four of the martyrs, including a woman, fell in Dera refugee camp that came under heavy shelling. A young man was killed in Yarmouk refugee camp, south of Damascus, the group said, adding that he was gunned down by a sniper while walking near a secondary school. It said that another youth was killed in clashes in Khan Danun refugee camp. The action group noted that armed clashes and mortar shells, which slam the refugee camps almost daily, inflict casualties among the refugees, adding that all Palestinian refugee camps in Syria have been under tight siege for months. 14 Palestinians were killed over the last week in the continued violence in Syria, a statement of the Action Group for Palestinians in Syria showed. The group said Saturday in a statement that it "documented the deaths during the period between 9 and 15 November 2013,"
On Saturday, November 9, young man Mahmoud Awad died in a shooting in the Yarmouk refugee camp. On Sunday, November 10, child Omar Hussein died of drought and lack of food and medical care due to the blockade imposed on the Yarmouk refugee camp, while young man Fayez al-Hassan passed when a shell struck the Deir Yassin Street in behind Palestine Hospital. On Monday, November 11, young man Maher al-Nassar of the Yarmouk refugee camp, held by the Syrian army for nine months, was tortured to death in the central Syrian security prisons, while Ahmed Zaidan died in the shelling of the Yarmouk refugee camp. On Tuesday, November 12, Hassan Awad , and Ibrahim Temaa fell in the bombing of al-Orouba neighborhood in the Yarmouk refugee camp, while Ali Troah died of his wounds he sustained in a sniper fire at the entrance to the Yarmouk refugee camp a few days ago. On Thursday, November 14, youth Ahmed Jihad, a recruit of Palestinian Liberation Army, died in clashes between the army and Syrian rebel groups; Maher Khattab, a resident of Jaramana refugee camp, died after being injured by shrapnel in the Qishleh area; Waseem Jariyan fell in clashes in the Yarmouk refugee camp. On Thursday, November 15, Mosa al-Shalhawi died of wounds he survived after an earlier bombing of the Maliha area in Rural Damascus. Bashar Aidi died after being injured by shrapnel of a shell that fell a few days ago at the Yarmouk refugee camp , while Bilal Omar of the Yarmouk refugee camp died of wounds he suffered several ago days in a bombing of the camp. More Palestinians were killed in the armed clashes and projectile attacks that happened during the last 24 hours in Palestinian refugee camps in Syria. 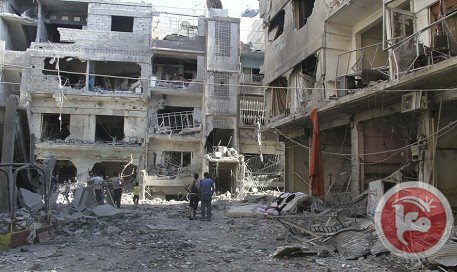 The action group for the Palestinian refugees in Syria said on Saturday that two Palestinian refugees were killed in Al-Yarmouk camp, south of Damascus, and a third one was killed in the countryside of Damascus. The action group affirmed that the Palestinians in Al-Yarmouk refugee camp, under tight blockade for 123 days running, organized a rally following the Friday prayers to demand the warring parties to neutralize the Palestinian refugee camp in the Syrian conflict. The protestors also called for executing the initiative of the Palestine liberation organization (PLO) and ending the blockade imposed by the Syrian regime forces on Al-Yarmouk refugee camp. Palestinian activists in Syria confirmed that 5 refugees in the Yarmouk refugee camp (south of the capital Damascus) were killed during the shelling that targeted the camp in the past 24 hours. Action Group for Palestinians in Syria said in a statement that the bombing which targeted the neighborhood of Arouba in the camp killed 4 Palestinians, and caused many injuries. Meanwhile, the Palestinian refugee Ali Tarwiyah from the Yarmouk camp died last night of wounds he sustained a few days ago after being shot by sniper. The group pointed to the continued bombings and attacks targeting all the Palestinian camps in the Syrian territories, and which coincide with the tightening of the blockade, especially in the Yarmouk camp which has been under siege for the 120th day unabated. The statement noted that the recent agreement to neutralize the Palestinian refugee camps from the ongoing conflict in Syria has not been enforced until this moment. The Action Group also confirmed that the Lebanese authorities have continued to prevent entry of a large number of Palestinian refugees displaced from Syria into its territories, and called on the competent authorities to move to save the refugees. Eight Palestinians were killed, on Sunday, due to the ongoing conflict in Syria, the Action Group for Palestinians of Syria reported. The group said in a statement, the Martyrs were Mohiuddin, Shahd and Mustafa Koshat, Hanan al-Farra, Mona Bandannain addition to two children Judy and Amran Bakr who were targeted by a rocket while trying to get out of Sbinah barrier. The youth Mohammed Fathi Mghari was also killed in a bombing attack on Dar'a camp, raising the number of the killed Palestinians to 1722. The Group pointed out that the camp of Handarat in Aleppo was bombed, while a shell landed on a house of the refugee Abu Yasser. The group also said that the refugees in the camps are still suffering from humanitarian crisis and living under extremely hard conditions as a result of the lack of food, medicine and baby milk.